The Epistle of St. Paul to the Philippians is one of his 4 Captivity Letters, along with Ephesians (which precedes it), Colossians (which follows it), and Philemon in the New Testament of the Bible. 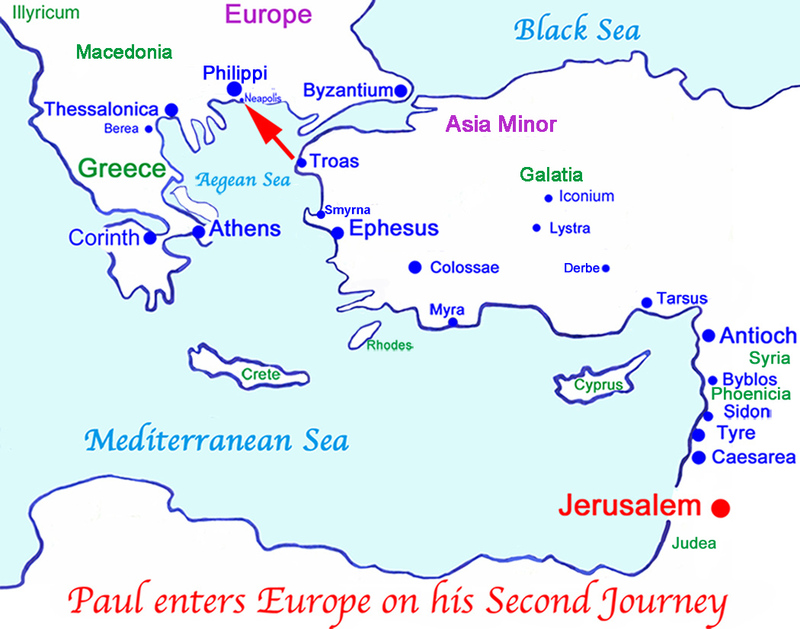 St. Paul established the first Christian community at Philippi in Europe on his Second Missionary Journey. While he was in Asia Minor, he had planned to travel to Bithynia, but the Spirit of Jesus - πνεῦμα Ἰησοῦ - redirected Paul to Macedonia (Acts 16:7), a journey which was the first recorded introduction of Christianity into Europe! Philippi was an important city in Macedonia, named after Philip of Macedonia, the father of Alexander the Great. Paul left Antioch with Silas on his Second Missionary Journey and evangelized Syria and Cilicia. After passing through Derbe, Paul met Timothy and baptized him in Lystra, and from there he accompanied Paul and Silas. Luke joined Paul, Silas, and Timothy in Troas for the voyage to Philippi (Acts 15:40 - 16:12). His Letter to the Christians at Philippi was written while he was in prison, referring to his imprisonment in Chapter One, verses 7, 13, 14, and 17. While Clement (Philippians 4:3), later Bishop of Rome, mentions in Chapter 5 of his Letter to the Corinthians (96 AD) that Paul was in jail seven times, there is definite biblical evidence that Paul was imprisoned three times: briefly overnight in Philippi with Silas before they were freed by an earthquake (Acts 16:23); in Caesarea (Acts 23:35) awaiting trial, and then finally in Rome (Acts 28:16), where he was free to live by himself, with the soldier who was guarding him. Paul's Letter to the Philippians is dramatic and inspiring, calls for Christian unity (Philippians 1:27), and, in the beautiful hymn of 2:5-11, presents one of the most explicit and profound testimonies in the New Testament of the Divinity and humanity of Jesus Christ. Paul uses the word kenosis from the verb κενόω, that Christ "emptied himself," that he divested himself of his Divine privileges, taking the form of a slave, humbling himself, even to death on a cross to save mankind. Chapter 3 has an autobiographical note. Philippians 3:12-14 is especially noteworthy, as Paul is picturing himself in a race, pressing on towards the goal, which is Christ Jesus himself. The Greek word ἀρετή in Philippians 4:8 is translated as virtue or moral excellence and refers to leading a virtuous life. And 4:13 is a favorite quote: "I can do all things through Him who strengthens me." The following Scripture is from the World English Bible, now in the public domain. The World English Bible is a modern English translation based on the American Standard Version of the Holy Bible first published in 1901, the Biblia Hebraica Stutgartensa Old Testament, and the Greek Majority Text New Testament. Paul and Timothy, servants of Jesus Christ; To all the saints in Christ Jesus who are at Philippi, with the overseers and servants: 2 Grace to you, and peace from God, our Father, and the Lord Jesus Christ. 3 I thank my God whenever I remember you, 4 always in every request of mine on behalf of you all making my requests with joy, 5 for your partnership in furtherance of the Good News from the first day until now; 6 being confident of this very thing, that he who began a good work in you will complete it until the day of Jesus Christ. 7 It is even right for me to think this way on behalf of all of you, because I have you in my heart, because, both in my bonds and in the defense and confirmation of the Good News, you all are partakers with me of grace. 8 For God is my witness, how I long after all of you in the tender mercies of Christ Jesus. 9 This I pray, that your love may abound yet more and more in knowledge and all discernment; 10 so that you may approve the things that are excellent; that you may be sincere and without offense to the day of Christ; 11 being filled with the fruits of righteousness, which are through Jesus Christ, to the glory and praise of God. 12 Now I desire to have you know, brothers, that the things which happened to me have turned out rather to the progress of the Good News; 13 so that it became evident to the whole palace guard, and to all the rest, that my bonds are in Christ; 14 and that most of the brothers in the Lord, being confident through my bonds, are more abundantly bold to speak the word of God without fear. 15 Some indeed preach Christ even out of envy and strife, and some also out of good will. 16 The former insincerely preach Christ from selfish ambition, thinking that they add affliction to my chains; 17 but the latter out of love, knowing that I am appointed for the defense of the Good News. 18 What does it matter? Only that in every way, whether in pretense or in truth, Christ is proclaimed. I rejoice in this, yes, and will rejoice. 19 For I know that this will turn out to my salvation, through your supplication and the supply of the Spirit of Jesus Christ, 20 according to my earnest expectation and hope, that I will in no way be disappointed, but with all boldness, as always, now also Christ will be magnified in my body, whether by life, or by death. 21 For to me to live is Christ, and to die is gain. 22 But if I live on in the flesh, this will bring fruit from my work; yet I don’t know what I will choose. 23 But I am in a dilemma between the two, having the desire to depart and be with Christ, which is far better. 24 Yet, to remain in the flesh is more needful for your sake. 25 Having this confidence, I know that I will remain, yes, and remain with you all, for your progress and joy in the faith, 26 that your rejoicing may abound in Christ Jesus in me through my presence with you again. 28 and in nothing frightened by the adversaries, which is for them a proof of destruction, but to you of salvation, and that from God. 29 Because it has been granted to you on behalf of Christ, not only to believe in him, but also to suffer on his behalf, 30 having the same conflict which you saw in me, and now hear is in me. If there is therefore any exhortation in Christ, if any consolation of love, if any fellowship of the Spirit, if any tender mercies and compassion, 2 make my joy full, by being like-minded, having the same love, being of one accord, of one mind; 3 doing nothing through rivalry or through conceit, but in humility, each counting others better than himself; 4 each of you not just looking to his own things, but each of you also to the things of others. 7 but emptied himself, taking the form of a servant, being made in the likeness of men. 12 So then, my beloved, even as you have always obeyed, not only in my presence, but now much more in my absence, work out your own salvation with fear and trembling. 13 For it is God who works in you both to will and to work, for his good pleasure. 14 Do all things without murmurings and disputes, 15 that you may become blameless and harmless, children of God without defect in the middle of a crooked and perverse generation, among whom you are seen as lights in the world, 16 holding up the word of life; that I may have something to boast in the day of Christ, that I didn’t run in vain nor labor in vain. 17 Yes, and if I am poured out on the sacrifice and service of your faith, I rejoice, and rejoice with you all. 18 In the same way, you also rejoice, and rejoice with me. 19 But I hope in the Lord Jesus to send Timothy to you soon, that I also may be cheered up when I know how you are doing. 20 For I have no one else like-minded, who will truly care about you. 21 For they all seek their own, not the things of Jesus Christ. 22 But you know the proof of him, that, as a child serves a father, so he served with me in furtherance of the Good News. 23 Therefore I hope to send him at once, as soon as I see how it will go with me. 24 But I trust in the Lord that I myself also will come shortly. 25 But I counted it necessary to send to you Epaphroditus, my brother, fellow worker, fellow soldier, and your apostle and servant of my need; 26 since he longed for you all, and was very troubled, because you had heard that he was sick. 27 For indeed he was sick, nearly to death, but God had mercy on him; and not on him only, but on me also, that I might not have sorrow on sorrow. 28 I have sent him therefore the more diligently, that, when you see him again, you may rejoice, and that I may be the less sorrowful. 29 Receive him therefore in the Lord with all joy, and hold such in honor, 30 because for the work of Christ he came near to death, risking his life to supply that which was lacking in your service toward me. 11 if by any means I may attain to the resurrection from the dead. but I press on, if it is so that I may take hold of that for which also I was taken hold of by Christ Jesus. 13 Brothers, I don’t regard myself as yet having taken hold, but one thing I do. 14 I press on toward the goal for the prize of the high calling of God in Christ Jesus. 15 Let us therefore, as many as are perfect, think this way. If in anything you think otherwise, God will also reveal that to you. 16 Nevertheless, to the extent that we have already attained, let us walk by the same rule. Let us be of the same mind. 17 Brothers, be imitators together of me, and note those who walk this way, even as you have us for an example. 18 For many walk, of whom I told you often, and now tell you even weeping, as the enemies of the cross of Christ, 19 whose end is destruction, whose god is the belly, and whose glory is in their shame, who think about earthly things. 20 For our citizenship is in heaven, from where we also wait for a Savior, the Lord Jesus Christ; 21 who will change the body of our humiliation to be conformed to the body of his glory, according to the working by which he is able even to subject all things to himself. Therefore, my brothers, beloved and longed for, my joy and crown, so stand firm in the Lord, my beloved. 2 I exhort Euodia, and I exhort Syntyche, to think the same way in the Lord. 3 Yes, I beg you also, true partner, help these women, for they labored with me in the Good News, with Clement also, and the rest of my fellow workers, whose names are in the book of life. if there is any virtue, and if there is any praise, think about these things. 9 The things which you learned, received, heard, and saw in me: do these things, and the God of peace will be with you. 10 But I rejoice in the Lord greatly, that now at length you have revived your thought for me; in which you did indeed take thought, but you lacked opportunity. 11 Not that I speak in respect to lack, for I have learned in whatever state I am, to be content in it. 12 I know how to be humbled, and I know also how to abound. In everything and in all things I have learned the secret both to be filled and to be hungry, both to abound and to be in need. 13 I can do all things through Christ, who strengthens me. 14 However you did well that you shared in my affliction. 15 You yourselves also know, you Philippians, that in the beginning of the Good News, when I departed from Macedonia, no assembly shared with me in the matter of giving and receiving but you only. 16 For even in Thessalonica you sent once and again to my need. 17 Not that I seek for the gift, but I seek for the fruit that increases to your account. 18 But I have all things, and abound. I am filled, having received from Epaphroditus the things that came from you, a sweet-smelling fragrance, an acceptable and well-pleasing sacrifice to God. 19 My God will supply every need of yours according to his riches in glory in Christ Jesus. 20 Now to our God and Father be the glory forever and ever! Amen. 21 Greet every saint in Christ Jesus. The brothers who are with me greet you. 22 All the saints greet you, especially those who are of Caesar’s household. 23 The grace of the Lord Jesus Christ be with you all. Amen.